Motivated to do the right thing for the environment, Tom Stellar has been working on removing an invasive tree species called buckthorn. Spring signals to many rural landowners to get outside, enjoy the fresh air and tackle a project on their property. Tom Steller of Caledon is no exception. Motivated to do the right thing for the environment, he has been working on removing an invasive tree species called buckthorn. His efforts though, have been thwarted by the tree’s resilience and the size of the infestation. 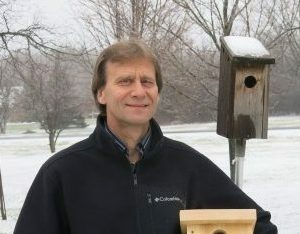 An avid birder, Tom is also using the Landowner Action Fund to subsidize costs of replacing old bird nesting boxes. Over the past 23 years, he has counted 132 different species on his property including bluebirds, tree swallows, the occasional chickadee and countless wrens. By removing the buckthorn, the property will shift back to a more open meadow landscape. Tom is looking forward to seeing grassland birds like meadowlark and killdeer return to his property. If you are thinking about a project for your property from invasive species removal, to well maintenance or creating wildlife habitat, get in touch with your Countryside Stewardship Team at CVC. Ask for Alison Qua-Enoo at extension 438. We’d love to hear from you.